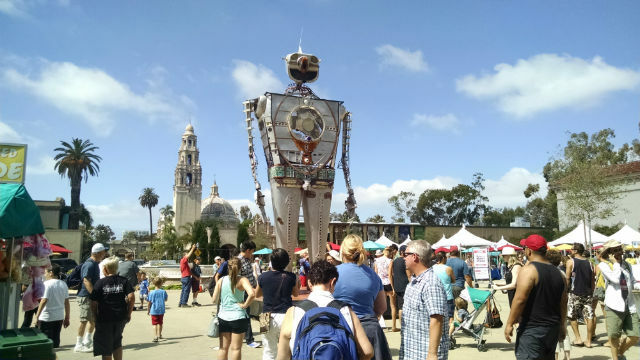 Once killed off in court, a plan to remove vehicles from the Plaza de Panama in Balboa Park was revived Thursday by Mayor Kevin Faulconer, who also proposed a ballot measure on funding upgrades at Mission Bay and other regional parks. The Balboa Park plan would remove 6.3 acres of roadways and parking lots and return them to park-like settings, build a bypass bridge to direct traffic away from the center of the park and construct a three-story underground parking structure with nearly 800 spaces. The plan was proposed by Qualcomm co-founder Irwin Jacobs and supported by the City Council in 2012, but opponents were able to convince a Superior Court judge the following February that the project violated San Diego’s municipal code. According to the mayor’s office, the ruling was later overturned on appeal, and the state Supreme Court refused to hear the case. Jacobs, chairman of the Plaza de Panama Committee, said its members are excited about the plan and will raise the money needed to carry it out. “Although we were not able to realize the Plaza de Panama project as a component of the (2015) centennial celebration, its completion just a few years later will forever remind us of the inheritance bestowed by the visionary founders and be a source of enjoyment for ourselves and future generations,” Jacobs said. Along with donations, the project will be funded by city infrastructure dollars and parking garage revenues, according to the mayor’s office. Regarding Mission Bay, Faulconer is proposing a ballot measure that would extend a provision of the City Charter that provides a funding stream for improvements. Currently, the section that’s in effect until 2039 directs any Mission Bay lease revenue above $20 million a year to capital investments in Mission Bay Park (75 percent) and other regional parks like Balboa Park and Mission Trails (25 percent). The change would extend the provision an extra 30 years and give the other regional parks a 35 percent slice of the lease revenue pie, according to the mayor’s office. Staff said the longer time period would allow them to take out a bond to pay for quicker projects now in Balboa Park, where some buildings are in urgent need of renovation, and use the future revenue for debt service. “Just as our forebears who created Mission Bay Park and Balboa Park did before us, it’s now our opportunity to leave our generation’s mark on San Diego’s park space and historic treasures,” Faulconer said. The proposal received unanimous support from the City Council’s Infrastructure Committee today but will have to receive full council approval to make it onto an election ballot. “We obviously need to invest more in Balboa Park and our other regional parks, and moving forward with the provisions that are in this amendment I think will enable greater flexibility, both for projects within Mission Bay — obviously a key priority — and also some of our other parks as well,” committee Chairman Mark Kersey said. The committee members also asked staff to study whether a shorter extension might be better, determine which projects might be paid for by a potential bond and have the base $20 million figure adjust with inflation. Staff were also asked to look into ways to reallocate funds, if necessary, to comply with terms of a trust in which the state turned over Mission Bay to the city.